Ultra Cameo Gem Proof 2019 Jefferson Nickels! 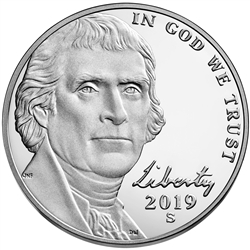 The 2019-S Proof Jefferson Nickel. Each of these 2019-S Proof Nickels are in Gem Proof condition with Deep Cameo fields and mirror like images. Beautiful coins!